Hey Guys! My last Valentine's day look was pretty dramatic, so I wanted to create a softer look. I still wanted to incorporate the pink and purple shades, because that is totally V-Day. This is what I came up with! Hey Guys! Today I am going to do another make-up look. It's a look with a full face of make-up using natural colours, it's really glowy, which makes it a bit more glam. Hey Guys! A really long time ago I got a set with some Lush products gifted by two of my friends. The package came with a shower gel, a bubblebar, a soap and this bath bomb. I already used all of the products, but I forgot about using the bath bomb! Today I am going to review it and show you a little demo video of it. Hi Guys! I haven't blogged for a week, because I was very sick, but I feel better again and I wanted to post something. About a week ago I created this make-up look, which I think is perfect for Valentine's Day. In this post I am going to show you how to recreate it! Hi Guys! I have had this palette for over a few months, but I did not make a review about it yet. I now have used it a lot and I have had enough time to try it out. Today I am going to do a review on it! Hey Guys! I love MAC lipsticks and I've got a long list of colours I want to try out, luckily I received one on my birthday. Today I am going to show you the MAC Satin Lipstick in 'Twig'. Hey Guys! I didn't post the last couple of days, because it was my birthday yesterday and I was busy celebrating it. I got gifted a lot of make-up, so I have a lot of reviews waiting for you, but I'm starting off with a really popular eyeshadow palette; the abh modern renaissance palette! Hi everyone,welcome to my blog! 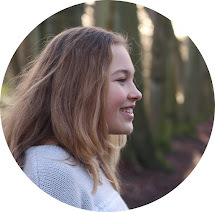 I am Bobbi, I am 15 years old and I live in the Netherlands. On this blog I write about make-up, fashion, lifestyle and more. TrendyPineapple. Ethereal theme. Powered by Blogger.